Hey everyone, I’m Josh thanks for coming back for another Monday Money! I’ve talked a bit about cash back credit cards in the personal finance blogosphere and it’s sparked quite the conversation. It seems like credit card rewards have been popular from the day they were created and, continue to gain in popularity every day! 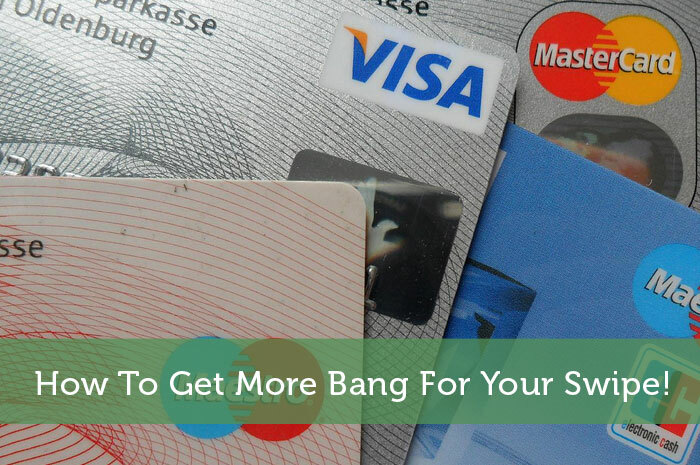 However, to get the most bang for your swipe, you’re going to have to use tact when you use your card. Annual Fee – Some rewards credit cards have astronomical annual fees while others don’t have any annual fees. To get the most bang for your buck, choose a card or two that you pay very little if not nothing annually to have. Interest Rate – You’ll probably want to avoid these at all cost and, it’s definitely possible. But, you always want to know what you will pay if you’re not able to pay your balance off by the end of the month. If nothing else, knowing your interest rate will serve as an inspiration to pay your credit card off completely within the grace period. Rewards Program – What kind of rewards does the card offer? Are they rewards that you will use? If you live in Oregon and, don’t like to travel, what use do you have with the Disney rewards card by Chase? You’ll never go to Disney and, if you do, you’re not doing it annually! Choose a rewards program that you will use. Follow Tara’s Example – If one credit card has a promotion for more cash back on a certain purchase, it’s best to use that card when making those purchases. Make sure that you keep in touch with the promotional rewards. One of my favorites is the Discover It card because the 5% cash back categories rotate! Make Bi-Weekly Payments – Most rewards credit cards come with a grace period that’s about a month long. At least, if you find the good ones. If you pay your credit cards off on a bi-weekly basis, you are sure to pay the card off within the grace period. This way, you don’t pay a penny in interest. Use A Spreadsheet To Keep Close Tabs On Spending – Making a spreadsheet is a pretty simple process. All you need o do is list your accounts and your balances on each. Every day, update your balance before you go to sleep and make sure you’re not getting close to debt that you can’t afford to pay off! Enjoy Your Rewards – Make sure to take advantage of the rewards you earn. If they just sit as points on an account, they’re doing nothing for you. Your lender isn’t going to call you and say “Hey there, let me give you some free stuff!”. It’s up to you to reach out to your lender and take advantage of the rewards you’ve earned. Thanks for reading, I hope you’ve enjoyed this week’s Monday Money! If you have any questions or comments, drop me a line below…I’d love to chat! Thanks for the shout out! Just to clarify so people don’t think I’m crazy in debt, I am very careful with my cards and pay them off in full monthly. It can be easy for people to lose track of what rewards cards are for what purchases so I don’t advise going crazy in the rewards game if you think you may be easily lost or are easily tempted to spend more than you earn. Also, all of those rewards cards except one have no annual fee, so make sure if you sign up for more than one that they don’t all have annual fees. If you’re not at least breaking even in the cost of the annual fee, it’s not worth it. Note to breaking even though… My Delta Skymiles card breaks even just by flying one round-trip with my fiancee with the free checked bags ($25 per bag each way, $100 for two people for one round-trip), so you can break-even in different ways. Sounds like you have a good system to me, but yeah it’s not for everyone. If you’re not organized enough it can be easy to let the credit card companies win at this game. I’m the same way that I pay off my credit cards in full each month, but I keep things simple by only going for cash back. Down the road when I travel more I might consider switching things up. Credit cards can be such valuable tools if used properly. If you are looking for travel rewards it’s easy to get thousands of dollars worth of travel for little cost. I couldn’t agree more, Sean. You, as the owner of the card, just have to know how to it, though. Yes you do need to know the ins and outs of your card to truly reap the full benefits. There are often limitations and bonus categories to watch out for. My personal opinion is that it’s best to stick with cash rewards. I don’t like the monkey math that goes into determining how much each of my purchases will actually be worth in rewards or the chance of being blocked from traveling at a particular time. lol ‘monkey math’. I don’t understand their rewards points systems either. They all say miles yet those miles equate to different amounts and usually nothing to do with the actual miles of the flight. That being said, I do think airline credit cards likely produce the best rewards provided you would be flying anyway. I think people can easily get these cards and the best way to do thing confused. Thanks for the post Joshua and answering Tara question. I think a lot of people will find this helpful. As for me though I am just sticking with the 2 cards I have for right now. I don’t think I’ll be expanding my credit card selections anytime soon either. I already have far more credit than I need. It would only make sense for me if it got me extra rewards somewhere I shop regularly. We just took a 6 day vacation in San Diego and we used our hotel credit cards. We didn’t pay for a single night this trip. It was really nice because we had extra money to spend on our trip instead of the hotels. Nice work Tanya. I really wish I had some hotel points for my last road trip. That ended up being a significant portion of my trip spending. I love churning credit cards for cash back and travel rewards. It is one of my hobbies! I just finished a churn and am deciding which card to churn next at this very moment! If my monthly expenses were higher I’d definitely have multiple cards lined up to milk benefits from once each one is at the maximum rewards for the month. The wife and I both have our favourite credit cards that give us the best rewards. I put all the household items on my card and she puts all the groceries on hers. We get money for free for spending, you can’t beat that. As long as the bill is paid in full, we’re ahead of the game. That’s a good idea to put all grocery spending on one card. You can often find cards that give extra cashback at grocery stores. You can take advantage of that and buy gift cards for other stores from your grocery store too. I love using rewards for travel. Free travel for things I already buy just makes perfect sense. It definitely makes travel more affordable. Then if you use that card for your travel related purchases you can often earn bonus rewards. I wouldn’t go so far as to say it’s free Jacob haha. No vacation really is free even if your credit card company is paying for the flight. There are bound to be all kinds of extra expenses. That’s actually a big part of why I don’t use a travel credit card yet. Sound advice, but I would just recommend not getting too many cards, keeping track of everything can be a hell of a work! I agree. If you do want to get multiple cards at least go about it gradually to ensure that you can handle the additional organization required. I don’t use credit cards anymore (thanks to Dave Ramsey) but I used to love making big purchases on my credit card and racking up the rewards. I’d get a $50 gas card every couple of months and it was really nice to get that little bonus. That’s one of the Ramsey ‘rules’ that I really cannot agree with. That advice is given with the assumption that everyone who is following his tips is unable to properly control their spending. While a cash only system might be necessary for some people, for others it just makes things more expensive and less beneficial. I always use a rewards card…I miss my chase cash plus which gave 5% on gas, supermarket and drugstore. Now I use Discover/Chase Freedom and Sallie Mae WorldMaster Card to get the 5% in different categories. My wife doesn’t really do this…I was thinking I’d make a spreadsheet for her so she can optimize those rewards! I hate it when credit cards you like are discontinued or their terms change on you. Talk about a blatant bait and switch. With my current credit card they were offering a much higher cash back rate when I applied for it. Then shortly after getting it, that rate dropped way down. I should probably look around for a better option. I love using my credit cards for rewards! I pay them off every month and keep track of all of them via Mint. Makes it easy. I have three cards I primary use for the different rewards. A Costco Amex card for Costco rewards, gas, and restaurants. Chase Freedom and Discover for 5% rotating categories. Between the three I can usually get a good amount of cashback! Smart idea to use multiple cards like that when some have rotating bonus categories. Also smart to keep track of it all with Mint as it would be much easier than trying to watch each account separately. If you want to get the most out of your credit card reward system I recommend trying out an Android application called Wallaby – Best Credit Card. It aims to help you make the most out of your credit card rewards systems by recommending which card to use when you tell it where you’re looking to spend.